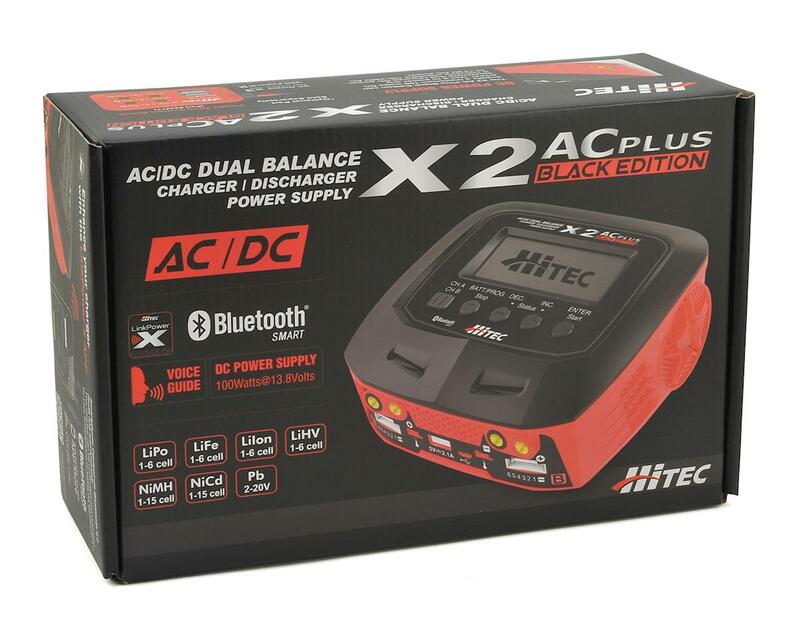 The expansion of the Hitec charger line continues with the introduction of their X2 AC Plus Black Edition AC/DC Dual Balance Charger/Discharger with built-in power supply. With increased capacity and compatibility, this portable, compact and reliable charging unit affords flexible charging of all battery chemistries whether you are at home or in the field. Its leading-edge power distribution mode allows efficient assignment of output power based on individual battery requirements while the Voice Guide feature makes for easy, user-friendly communication. 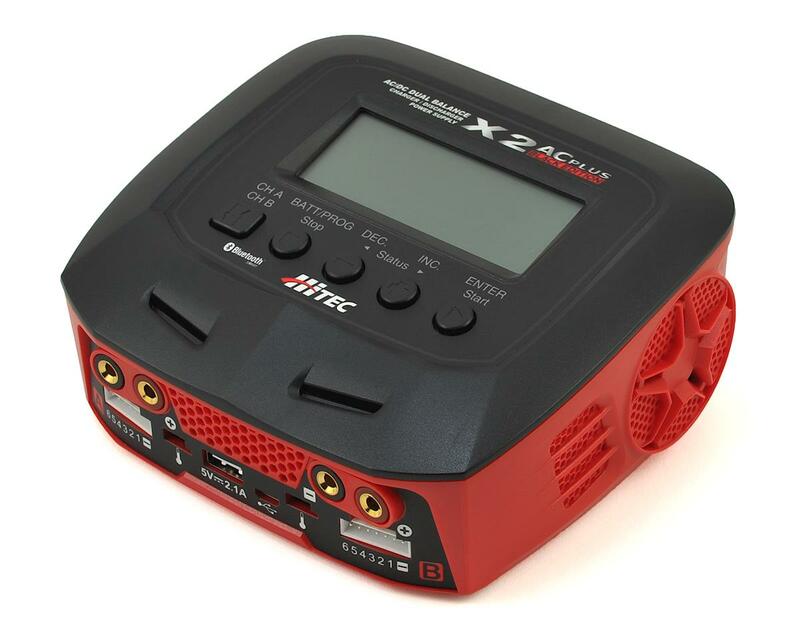 With a built-in 10-amp power supply, internal balancing circuits and 10 different charge/discharge profiles, the X2 AC Plus Black Edition is an absolute powerhouse. Featuring our "SCAN TO GO" and Smartphone control via Bluetooth, this charger delivers the high performance and convenience that you can always expect from Hitec. Awesome dual charger, plenty of power. 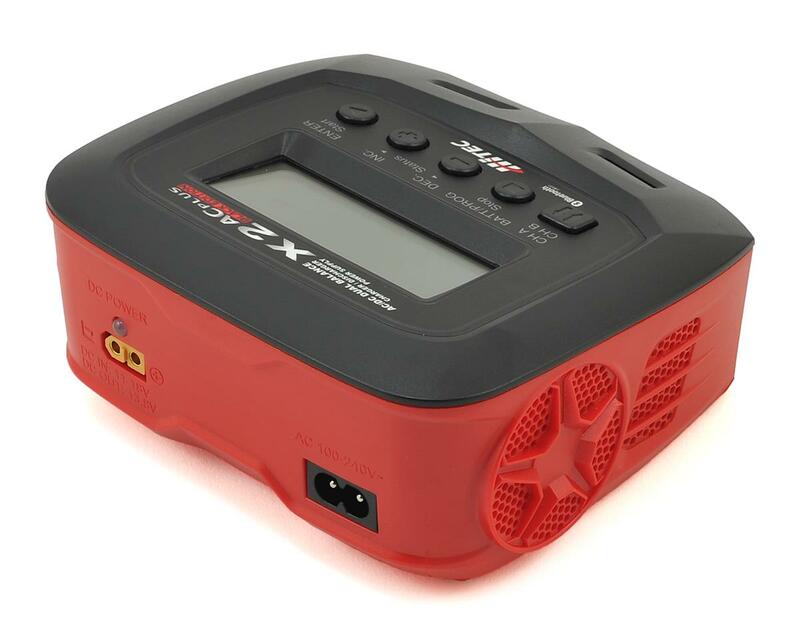 Easy Bluetooth connection using Link Power X App, app is very user friendly, can set up everything needed for battery set up from app in less than 30 seconds, Has fuel gauge showing battery level charge status. Can monitor both channels with App. You don't have to use App, but gives you easy access on 1 screen to all info needed while charging. Bonus has USB charging port for charging your smartphone. What a great charger ! I had a Graupner Polaron AC/DC charger and the Hitec puts it to shame for 1/3rd of the price. 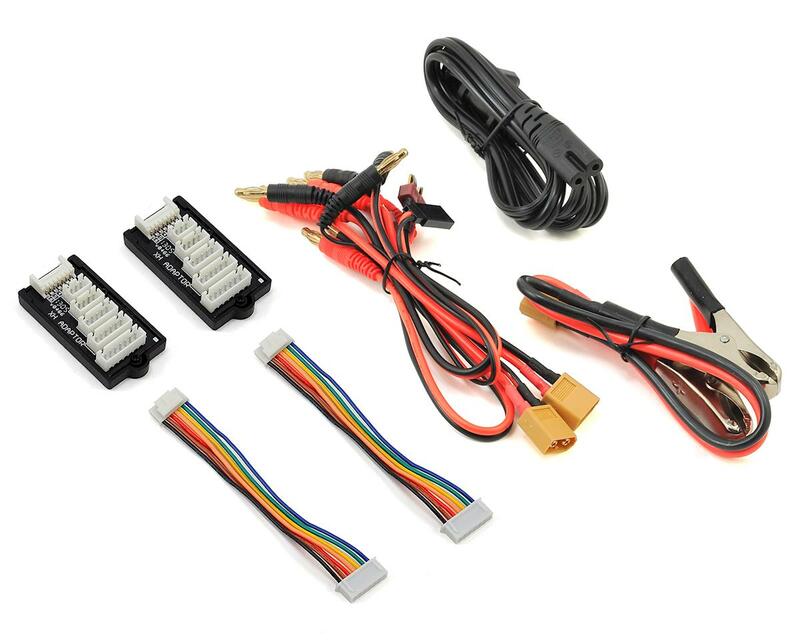 Very intuitive menu.The PC and Android control and monitor software work very well and allow remote programming of the charger...Fot the price you cannot do better than this ! Oh and she talks too !! Came back to RC cars after 20 plus year layoff. This charger is everything I expected after doing my research. Great for my basher batteries and the race batteries that are in my future. I should have gotten this one before. This is so far the best battery charger I've had. The process is easy and the smart phone app and the voice prompt adds a touch of convenience to it. I bought a Passport Ultra before this and I was so disappointed with it. I'm very satisfied with this purchase and would always be on my list. Great charger for the price. Easy to use. Great to have a discharge. Love the fuel gauge too. no problem, low cost , 1year warranty. Amazing charger. Does exactly what its supposed to. The bluetooth control using the smart phone app is awesome. Very good charger for the money, with lots of great features. Easy to use and program and small footprint. Good charger. I don't have any other "real" RC chargers to compare it to, but I can't see why I'll ever need to buy another unless this one breaks. My batteries all use deans, which this came with. The phone app works great on my android phone. It's easy to set up and run programs. The only annoyance is the voice that greets you every time you plug it in, but not a big deal. Update: Revising down to 2 stars. On DC power, this charger is supposed to be able to supply up to 100 watts and 10 amps per channel. My charger hits ~195 degrees Fahrenheit (internal temperature, not battery temperature) and throttles itself back to 1 amp/channel when trying to charge two 2S LiPos at 10 amps, which is about 75 watts per channel. Once it cools off a bit, it will work the amperage back up. This is at around 75 degree ambient temperature. I have done some testing and it seems my charger really only has the thermal capacity to supply about 110-120 total wattage, out of the rated 200, at normal room temperature. Update: Revising down to 1 star. Same behavior above persists at 70 degrees ambient. It actually drops all the way to 0 amps until the temperature drops to about 170. Would love to have my money back.